FEP or PVC - Daburn has all the flat ribbon cable solutions you will need. Daburn FEP ribbon cable reduces crosstalk, compared to PVC constructions. It provides hi-fidelity and dense signal transmission with low dielectric constant. Its low coefficient of friction and excellent abrasion resistance provide a unique non-adhesive and self lubricating surface quality which is ideal for robotics or printer head applications. In addition, it has low water absorption. The insulation strips and slits easily using conventional equipment available today. It resists corrosion and adhesion and offers the positive properties of PTFE in an Insulation Displacement Connector (IDC) configuration. Daburn PVC ribbon cable comes in a wide variety of products to meet your needs. Daburn DaFlex Silicone Flat ribbon cable is ultra-flexible. Finely stranded wire conductors are used for maximum flexibility and long life in dynamic, flexing applications. The wire conductors are encapsulated in crystal clear DaFlex Silicone insulation. Daburn DAFLEX .025˝ Pitch Micro IDC Silicone Rubber Flat Ribbon Cable is excellent for tight spacing applications that require dependable signal density. Ultra Flexible performs exceptionally well in harsh environments, & high/low temperatures. Daburn DAFLEX Silicone Rubber ribbon cable is ideal for many electronic applications that require better flexibility, a broader temperature range (- 65°C to 260°C) or a harsh environment. 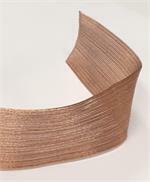 28 AWG copper conductors have ultra-flexible 19/40 stranding.